Bibim Guksu (비빔국수) – Create Your Own! Bibim guksu (비빔국수), literally meaning ‘mixed noodles,’ is one of many summer favorites in Korea. On any hot sticky summer day that erases your appetite, the combination of cold noodles, crunchy vegetables and, most importantly, the spicy, sweet, tangy gochujang (고추장; Korean hot pepper paste) sauce will bring you back in the right mood. It’s easy to make your own version at home. Cook the noodles, which only take a few minutes, chop up some vegetables in the fridge for toppings, then mix in a simple sauce that can be made ahead and stored in the fridge. If you want to start with some basic bibim guksu options, here they are. So Myeon (소면) – It’s angel hair-like thin noodle made with wheat flour. It’s pretty bouncy if cooked correctly. * It’s same as the Japanese somen. *All of the above have relatively short cooking times–a few minutes at most. If you want to make it extra bouncy, start with a big enough pot that will give enough room for noodles to move about. Boil water over high heat and put the noodles in. Wait until the water comes to a boil, then pour an extra cup of cold water. When the water comes to a boil again, taste for doneness (this may take a few minutes). When the noodles are done, strain them and rinse in cold water to stop cooking further and to retain the optimum texture. Toppings provide the visual appeal and variety in texture as well as nutrients. Vegetables are most common and a couple of thin slices of meat or fish are optional. Basic vegetable toppings include julienned cucumbers, carrots, cabbages, and scallions, which are great for a cooling crunch. 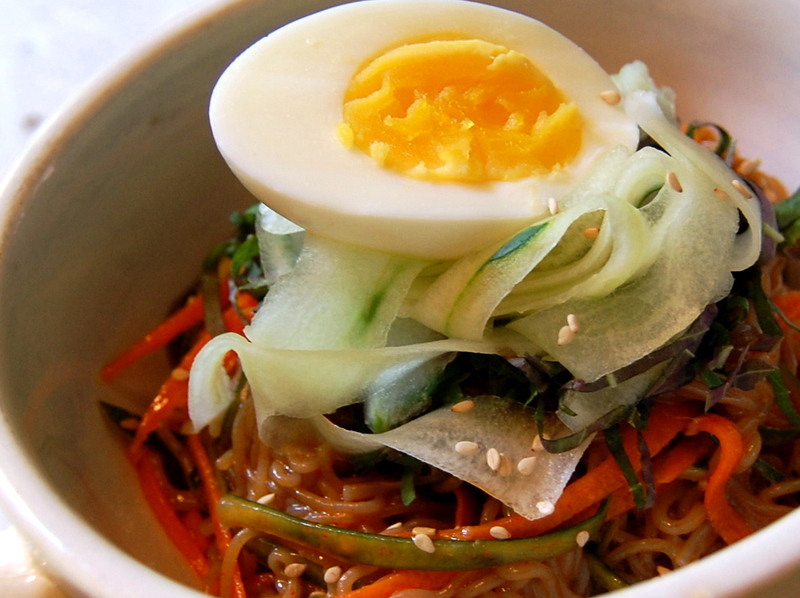 If you are familiar with Korean noodle dishes, you may have wondered why half of a boiled egg sits on top of the cold noodle dish. It adds white and yellow colors to an otherwise a red/green dish (from the spicy sauce and vegetables) and protein, which often lacks in this summer dish. The rumor also has it that the egg, meant to be eaten first, helps to balance off the rough, high-fiber buckwheat noodles, although I couldn’t find any verifiable source on this. Other common toppings include Asian pear, radish, perilla leaves, lettuce, and kimchi. I also like toasted seaweed (a.k.a. sushi nori, or gim 김) flakes. Now, the determining factor in bibim guksu is the seasoning sauce. To me, this is what makes it a Korean dish. The basic sauce can be made ahead and requires simple, easy ingredients. I usually make a small jar of it, which lasts for a few days in the refrigerator. As much as I believe in exact recipes, I’m not usually into writing them. Also, more often than not, especially when it comes to bibim guksu, my one-person portion of noodles tends to exceed what the noodle box instruction suggests. This is another reason to go with a ratio – my basic ratio that combines the spicy, tangy, and sweet flavors together. It’s good as is, but gives you a base with a plenty of room to experiment. Some recipes include sesame oil in the sauce mix, but I like mixing in sesame oil (1 TBSP per portion) right before serving because I really like the strong, fragrant sesame oil coming through my bibim guksu. Finish with a sprinkle of sesame seeds and enjoy! Happy Summer! Happy Bibim Guksu Season! I always love your posts Shinshine – so informative and so tasty! It helps so much that you include both the Hangeul and the Romanization in addition to the translated definition of dishes and ingredients. Thank you!! If you’re ever looking for a subject, I’d love to know more about the different mixtures of fillings for mandu and different cooking methods (like the steamed buns vs won ton-like wrappers). Thank you Tammy! Mix & Match = More freedom in the kitchen!